Howardsville, Colorado on the Animas River. So far on my tour through Colorado’s mining history, I have reported on how the ore was mined. Today, I got the chance to see how the ore was transported and processed at a mill. After completing my tour of the Old Hundred Mine near Silverton, I drove back down Stony Creek to where it joins the Animas River at a place called Howardsville, where some mining operations were still evident. 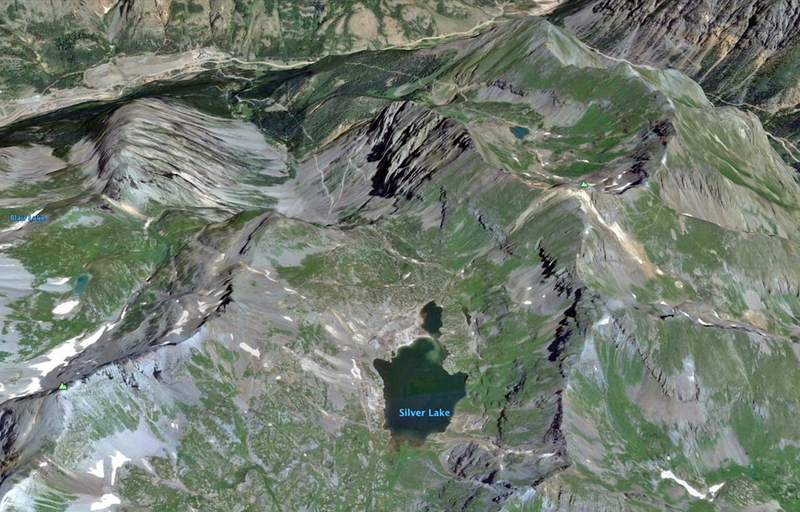 Google Earth view of Arrastra Gulch and Silver Lake. The Mayflower Mill is located at the bottom of the gulch in the upper left corner. I stopped along the way toward Silverton at the base of Arrastra Gulch. 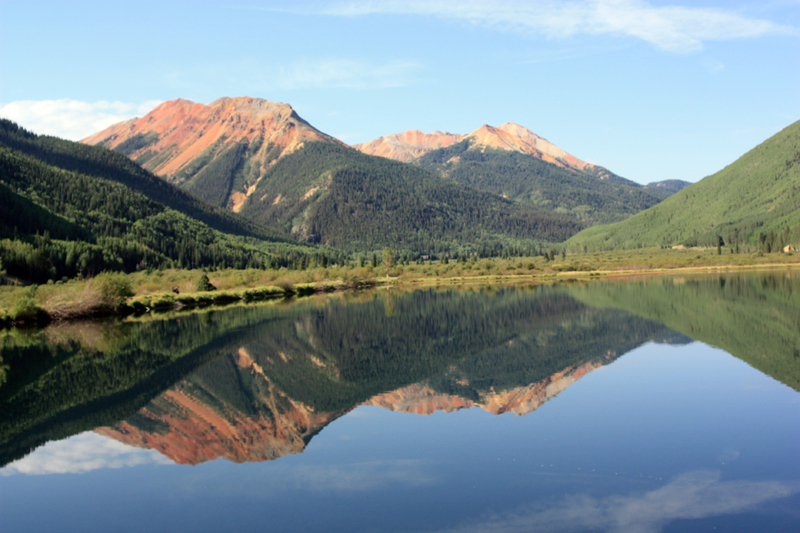 This is the location of the main mining area around Silverton and one of the richest deposits in all of the San Juan Mountains. Before a proper mill could be built to process the ores, a Spanish-style arrastra was built here, which is a circular area with a flat stone floor and a central post with arms coming out. Each arm had a heavy stone or iron weight that hung from it and which would drag over the ore and crush it. Mules, donkeys, or even humans would be used to push the arms around in a circle. 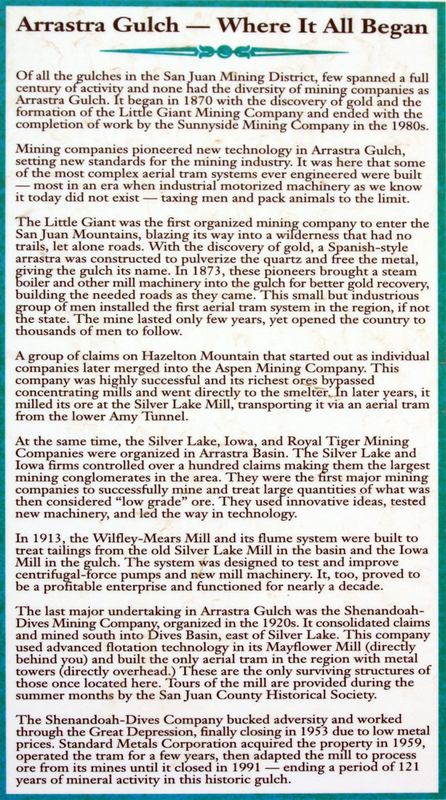 Once mills were built, the ore was transported to them from Arrastra Gulch and the high glacial circque above it (around Silver Lake) by tramlines or flumes. At one point as many as four separate overlapping trams were operating. The largest mill in the area was the Mayflower Mill (also known as the Shenandoah-Dives Mill) about two miles northeast of town. 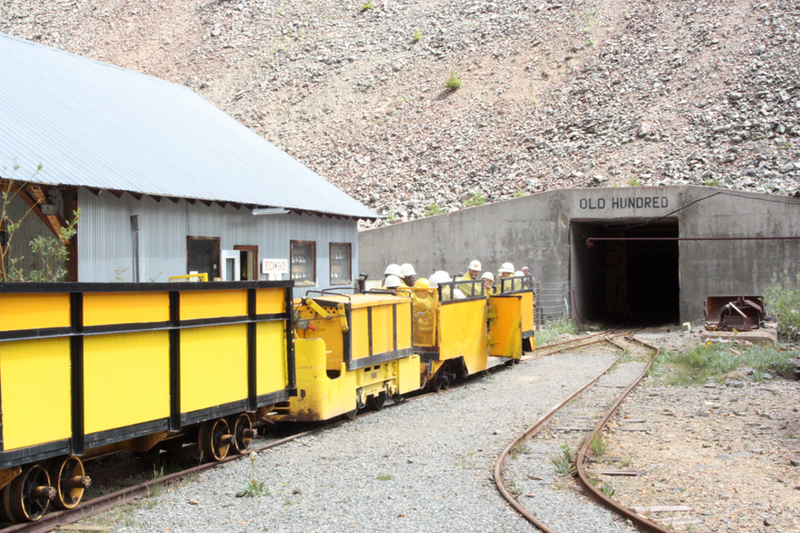 It was built in 1929 to process gold, silver, zinc, lead, and copper ores. Another large mill nearby was the Silver Lake Mill on the Animas River. 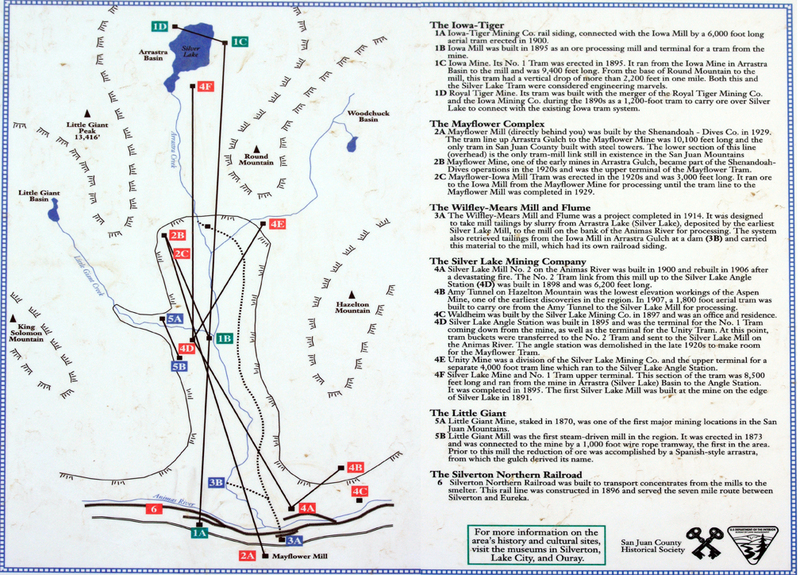 Map of aerial trams in Arrastra Gulch near Silverton, Colorado. Built of pre-framed Oregon fir and completed in six months for $373,000, the Mayflower Mill began processing ore in Feb., 1930 and continued in operation for 49 of the next 61 years, finally closing down in 1991. It is in fact still capable of operation, and all the original equipment is intact. 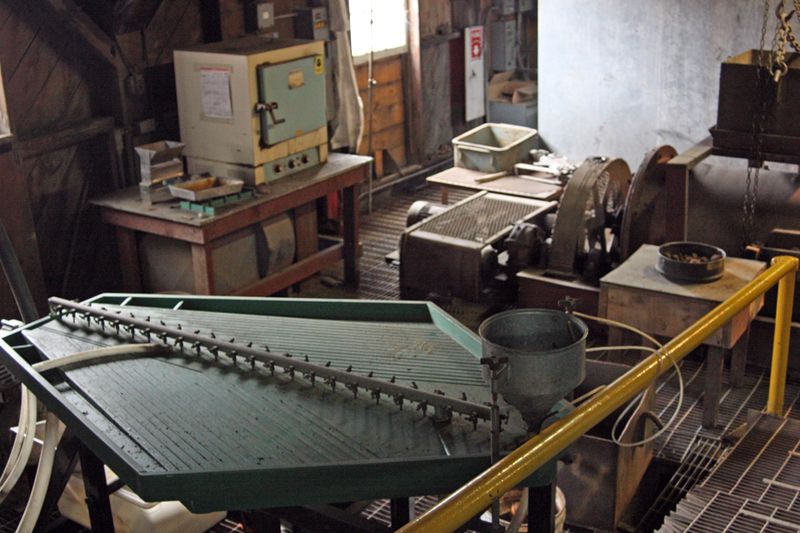 The historical society allows self-guided tours that start in the machine shop, then move to the tram station, ore storage bins, ball mills, flotation cells, recovery system, assay office, etc. 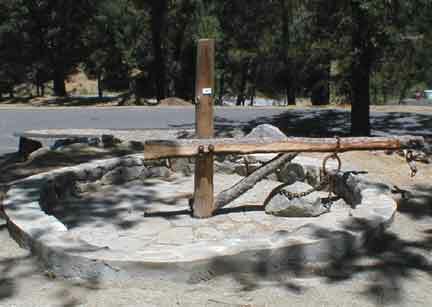 A restored arrastra in Groveland, California. Heavy rocks were dragged around in a circle to crush ore. 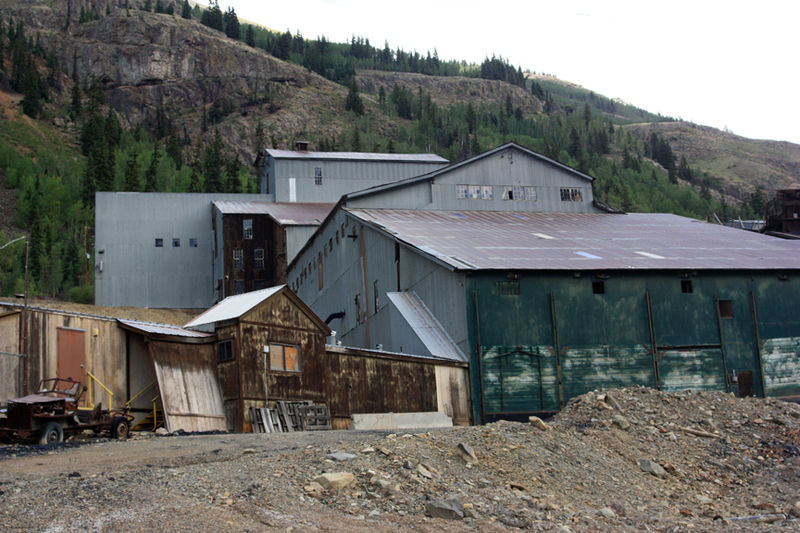 It was an extensive operation, the biggest in the San Juan Mountains, and employed the latest technologies available in 1929, including the new techniques of ball mill crushers, froth flotation of sulfide ores, and recovery of base metals as well as gold and silver. These techniques are still used today in such places as the concentration plant at Utah’s Rio Tinto/Kennecott Copper operation, although the scale there is enormous. 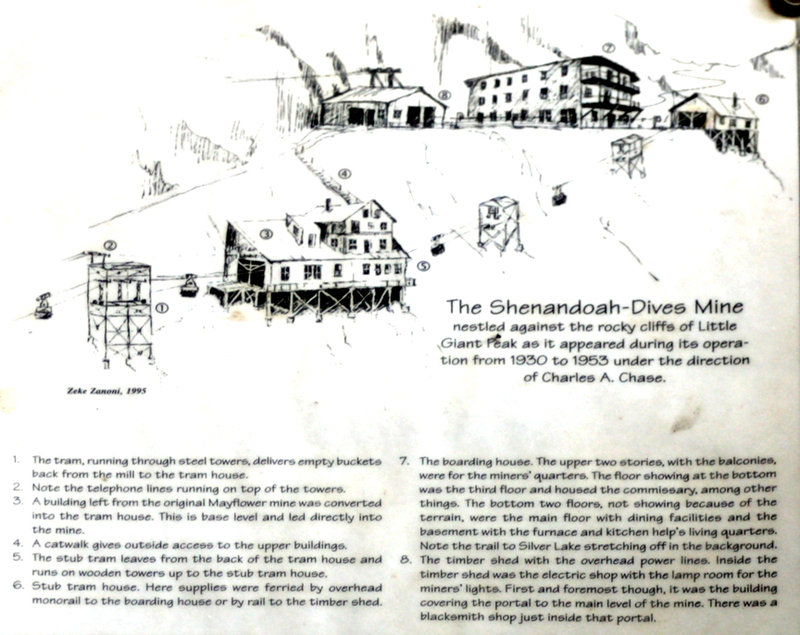 A sketch showing what the Shenandoah-Dives mine looked like during the 1930s. The aerial tramline connected with the Mayflower Mill. For its 61 years of operation, it processed over 9,700,500 tons of ore to produce 1,940,100 ounces of gold, 30,000,000 ounces of silver, and over 1,000,000 tons of base metals. 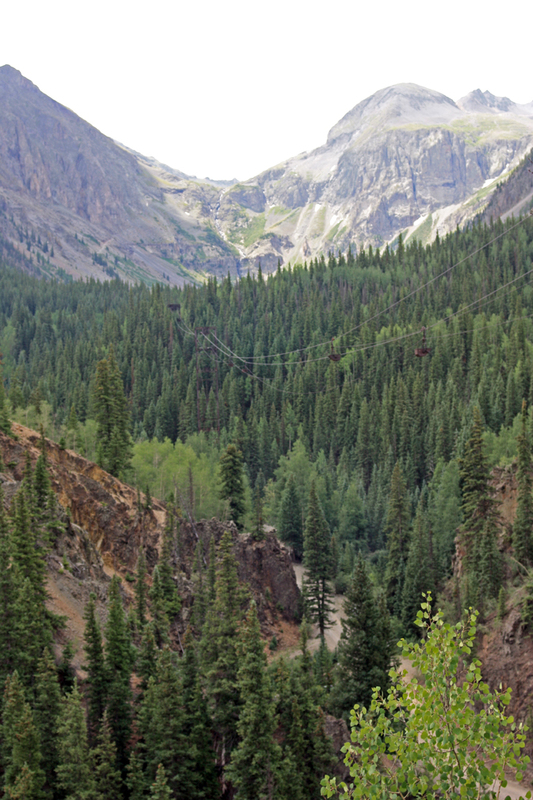 The aerial tramline connecting the Shenandoah-Dives Mine above Arrastra Gulch with the Mayflower Mill. The gulch is the canyon in the foreground, and the high circque is the basin around Silver Lake. The Mayflower Mill near Silverton, Colorado. A self-guided tour is available during the summer. The ore coming from the mines was about 5% metals and 95% waste rock (tailings). The metals have to be separated out, and this is done in stages so that all the metals (gold, silver, copper, lead, and zinc – the big five) could be individually removed and purified. This is done in three main steps: crushing, separation or reduction, and purification. 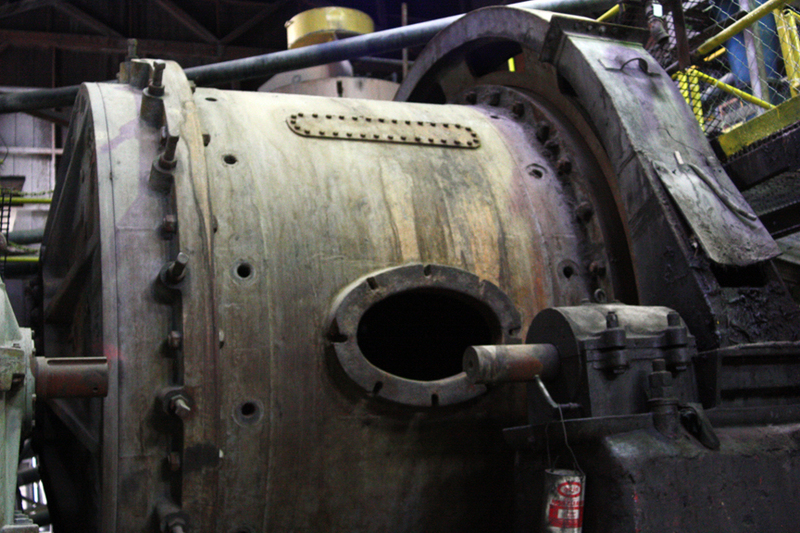 The final step was done by a smelter off-site, but the first two steps were done at the mill. Tram station at the Mayflower Mill. Full buckets descended from the mine by gravity, which also pulled the empty buckets back up. The ore arrived in large open buckets by tramline. Gravity brought the ore down and allowed the empty buckets to move back up the loop. The ore was brought into the mill at the tram station and dumped, then transported by conveyor belt to the cone crushers. It was screened for size, and if too big would be returned to the crushers. Cone crusher at the Mayflower Mill. It would crush the ore between rotating cones until it was pebble sized. 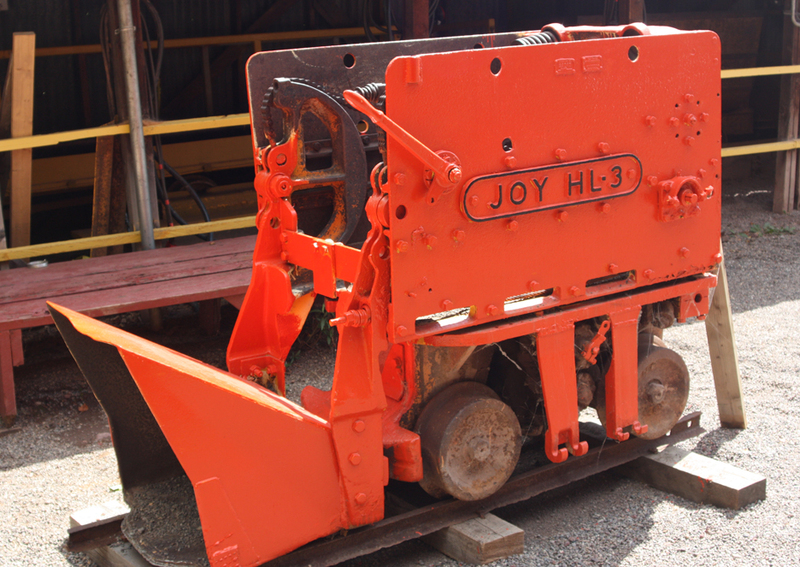 Once it was pebble sized, it would be transported to the Fine Ore Bin, which would hold 1200 tons of ore, enough for one full day of operation. The ore was then transported out of the bottom of the bin and mixed with water to form a slurry, then passed through a rod mill (which used long iron rods rolling around) where the ore was further crushed to a fine powder and sorted by a spiral classifier, an auger-like device that pushed the ore upward. If the ore was fine enough, it was pushed all the way to the top – if not, it would fall back down and be returned to the rod mill for further crushing. Rod mill at Mayflower Mill. 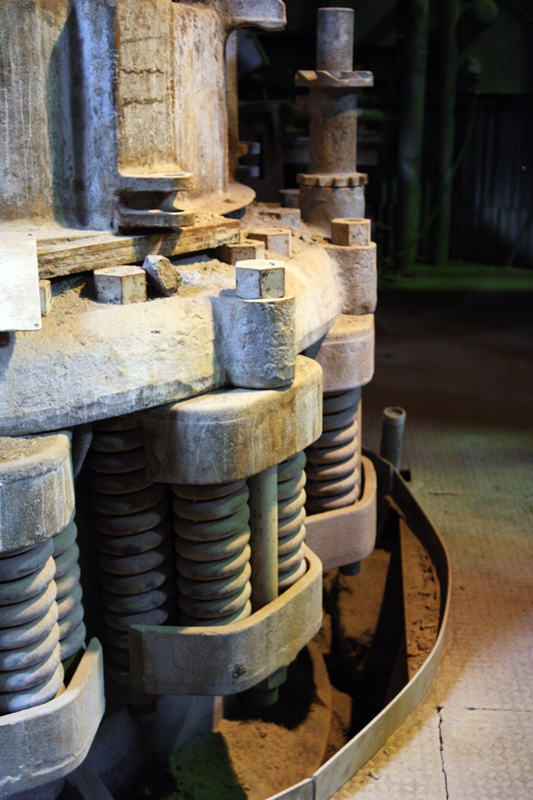 Iron rods were fed into the mill, then allowed to roll around inside to crush the ore to the size of sand grains. The powder, now the consistency of sand, was passed through a ball mill, with 2-3 inch diameter iron balls rolling around to crush the ore even finer. These balls were added frequently during the day through pipes from a ball bin. Now the ore was now the consistency of talc and fine enough to start to separate. Spiral classifier at the Mayflower Mill. Ore slurry from the rod mill would be pushed up the spiral. If it was fine enough, it would be pushed over the top. If not, it would return to the rod mill. The first metal to be separated was gold, using a system of settling jigs that pumped the ore through, allowing the heavier gold particles to settle out through vibration and suction. The lighter remaining material was passed on to flotation cells, where reagents and flocculents were added that would float the desired metals to the top of the tank solution while depressing or sinking the other metals. Lead was removed first, then copper, and finally silver and zinc removed in large tanks. The soapy bubbles would simply be skimmed off the top of the cells. Ball mill at the Mayflower Mill. 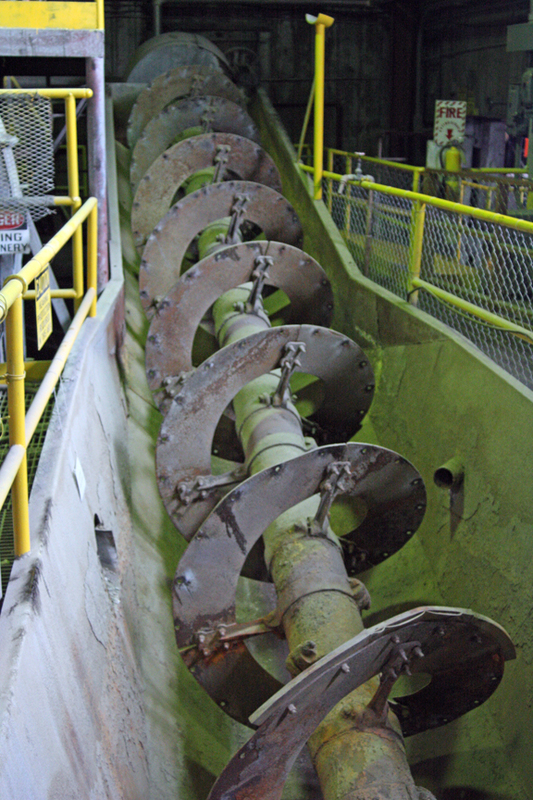 Ore crushed to the size of sand grains would enter the rotating drum and be crushed to powder by 2-3 inch iron balls. 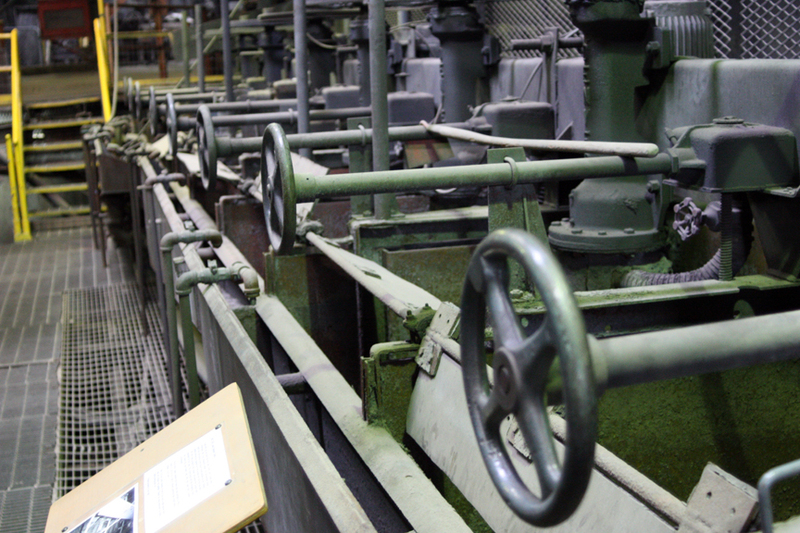 The flotation cell solutions were then passed through filters with pumps that pushed the water through, drying out the solution to a damp cake-like material that was then shipped to a smelter for final refining, where it would be heated to drive off the sulfides. Each day, samples were removed and filtered through a squeeze press, then sent away to an assayer to determine the percentage of metals in each day’s run. Gold jigs at the Mayflower Mill. Using air pressure, the lighter ore powder was suctioned away from the heavier gold particles. Meanwhile, the gold filtered out by the jigs was sent through a concentration process. It would be passed over a shaking Deister table where the gold would be caught by riffles and formed a streak to be collected. It was mixed or amalgamated with mercury to remove the gold from the remaining waste ore. The amalgam was then formed into rounded boats or cakes and heated in a retort at 1200 ° F for 12 hours to evaporate the mercury, which was bubbled through water to condense it for reuse. The remaining gold was now called “sponge” and was about 80% pure. It would be sent off to a foundery for final purification. Four to five sponges would be produced each week. Each sponge weighed about 22 pounds. 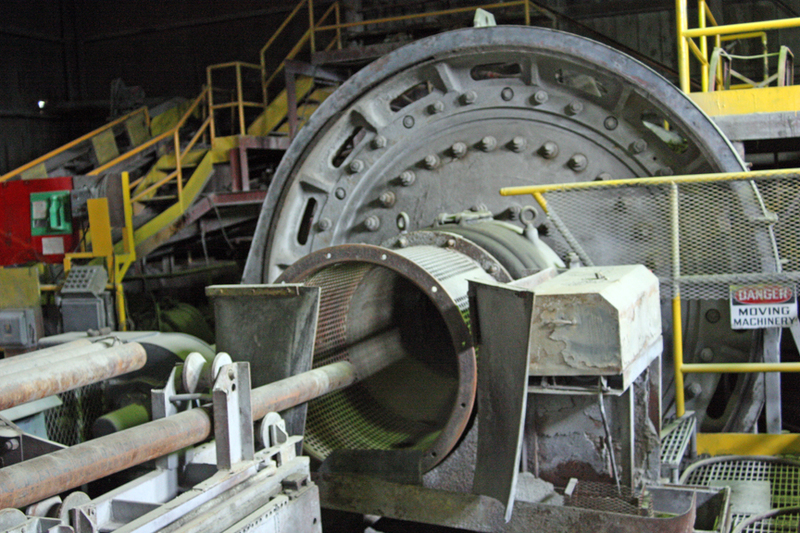 During the last year of the mill’s operation (1991), a new process was developed that eliminated the need for mercury (which was highly toxic). Lead flotation tanks at the Mayflower Mill. Reagents were added that would float the various metals, such as copper or lead, to the top of the liquid on soap bubbles which were skimmed off into the trough in front. The remaining metals were depressed to the bottom. Impellers would keep the solution agitated while blowing air through it. Once processed, the waste material is called tailings and was made up of water and sandy ground rock. It was pumped down to settling ponds, where the solid tailings would settle out. This was an innovation of the Mayflower Mill, as previously the tailings would simply be allowed to flow into the Animas River. The high sulfur and iron content in the tailings would travel down the river and created the reddish stains on the rocks that I noted on my train trip up the gorge several days ago. At the Mayflower Mill, the ponds were shifted so that the solid tailings would build up a series of mounds downhill from the mill. These have now been collected into a large tailings pile near the mill. Deister table at the Mayflower Mill. It would shake, causing the gold particles to separate out against the riffles. I found this self-guided tour to be fascinating from a chemistry perspective. 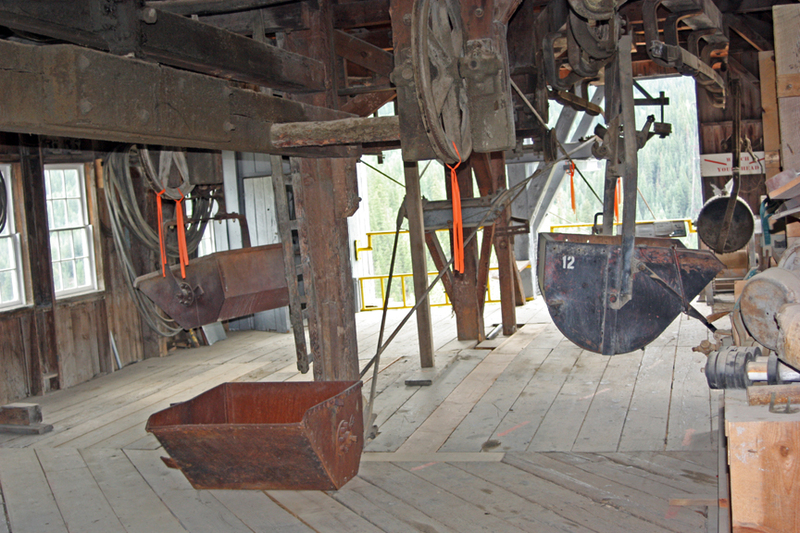 The mill used a system of physical separations to crush, concentrate, and amalgamate the ore. The final smelting used a system of chemical separations. It is a perfect example of a chemical engineering process, and was continually upgraded and improved during its 61 years in operation. 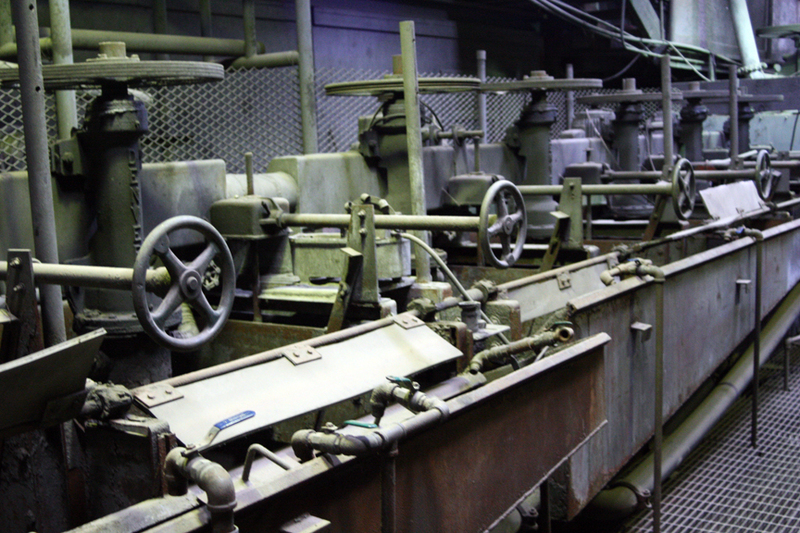 The mill could be run, during the night shift, with only three people. During the day there were additional people to do repairs and take samples, to run the gold process, and to run the machine shop. Shift supervisors oversaw the operation from the dog house, one man ran the crusher facility, and one man ran the flotation cells. This was the biggest operation of its kind in southwest Colorado and processed more ore than any other mill in the area. 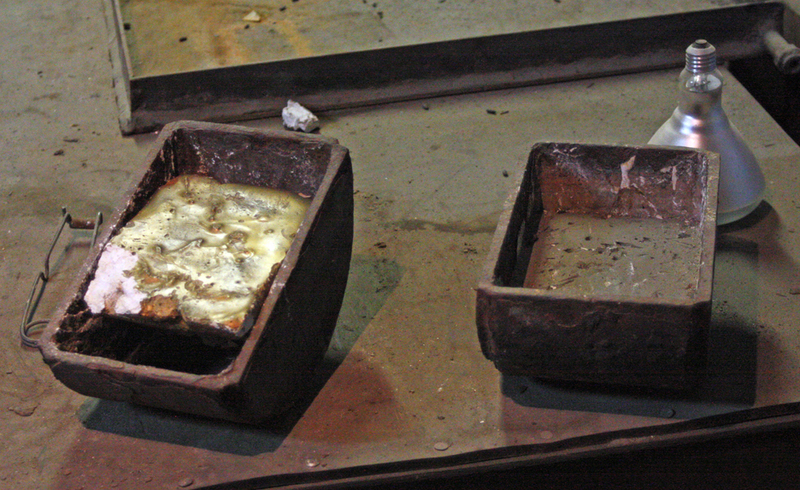 A model of what gold sponge looked like after being removed from the retort furnace. The holes in it are caused by mercury vapor bubbling out. Retort furnace and gold button mold at the Mayflower Mill. 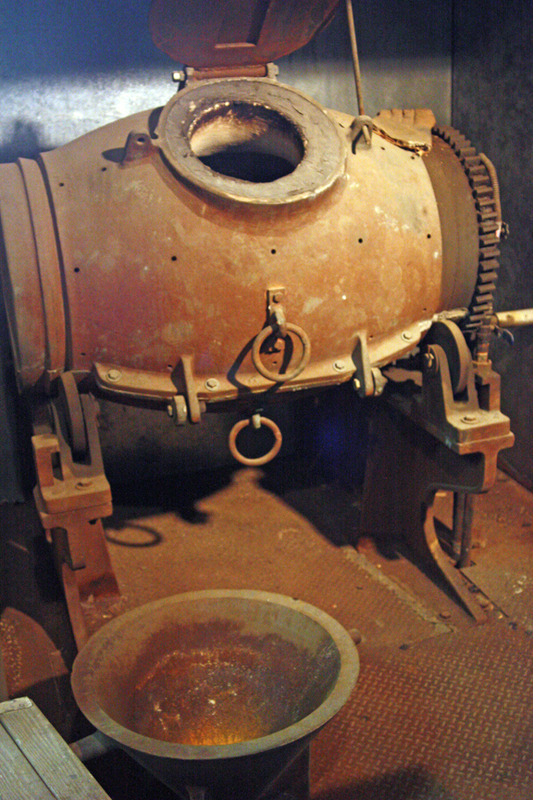 The gold particles would be amalgamated with mercury, then heated in this retort furnace to drive the mercury off. 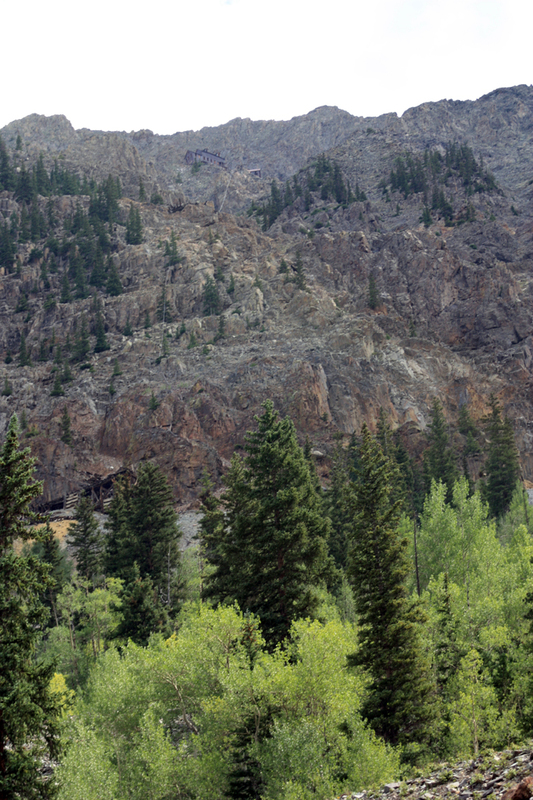 The Red Mountains near Ouray, Colorado. My original plans for this fifth day in Colorado’s mining towns was to drive north on Highway 550 to Montrose, then east on U. S. 50 and south on Highway 149 to Lake City and eventually Creede. But having to detour two days ago to Farmington, New Mexico to pick up a used rim for my minivan made it necessary to drive through Silverton without stopping. I did some quick calculating and found an alternate route that would allow me to hit all three places (but it would mean missing Alamosa and Great Sand Dunes National Park and having a very long day tomorrow). Since my trip is mostly about the history of mining in Colorado, I chose to take the alternate route. Alamosa will have to wait for another trip. I packed up and ate some doughnuts and other supplies I had that were still good. The ice in my coolers had long since melted and things were beginning to go bad. I videotaped some panoramic shots along Ouray’s main street and talked for a few minutes with a Native American wearing a veteran’s hat, whom I had seen around town. He had been to Provo and enjoyed visiting the national parks in Utah. Mining ruins near Red Mountain #2, near Ouray, Colorado. I drove out of town south on Highway 550, stopping to take photos of the Red Mountain peaks reflected in a small lake, as well as some mine structures I’d missed on my way in two days ago. Once over the top of the pass, I pressed on through Silverton, talking a gravel road out of town to the northeast toward Engineer Pass and Lake City, then southeast through a narrow river valley (Cunningham Gulch) to the Old Hundred Mine at the base of Galena Mountain. I arrived just at 10:00 in time to take the first tour. 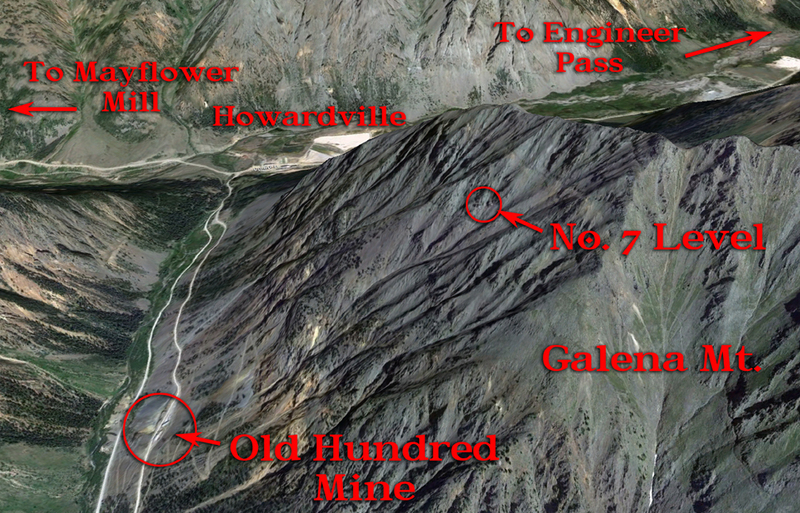 Location of the Old Hundred Mine on Google Earth. This mine was named after the 100th Psalm, where it says: “Make a joyful noise unto the Lord, all ye lands.” No doubt the prospectors who found this deposit made a very joyful noise! 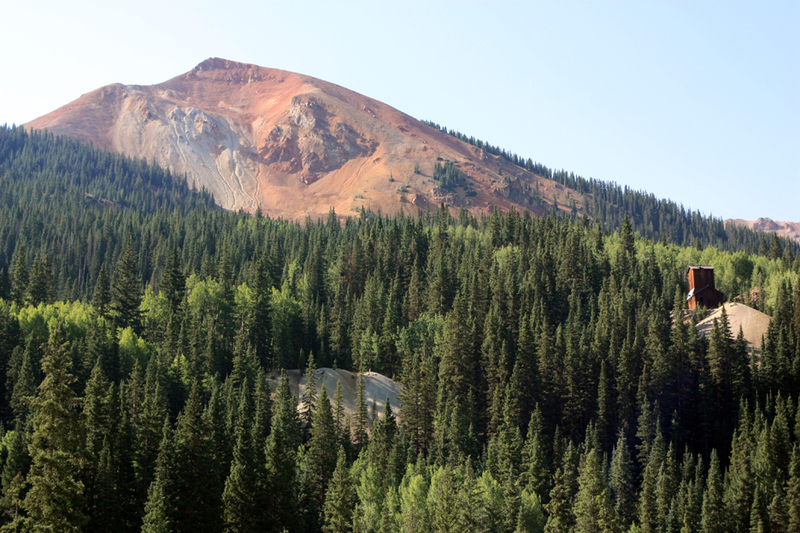 Galena Mountain was laced with veins of rich silver-lead-gold ore, and the Niegold brothers (Reinhard, Gustave, and Otto) staked claims on some of the richer veins in 1872. About 300 feet from the top of the mountain, they located the best vein of all at what came to be called the Number Seven Level. Other veins were located further down. The mountain was so steep that mining the higher levels was very difficult – supplies and equipment had to be lowered from the top of the mountain and ore removed on ropes to the bottom level. A small town grew up at the bottom with a hotel, a saloon, a post office, and cabins for the miners. It was called Niegoldstown. Well-educated and classically trained, the Neigold brothers would entertain the miners during the long winter months with music, operas, and plays. In the change room of the Old Hundred Mine. In 1904 additional investment built a trail that winds its way around and up to the Number Seven Level, where a boardinghouse with bunks and a tram station were built perched on the side of the cliff and anchored by cables to the cliff face. A tram station was also built at the bottom of the mountain, and massive foundations poured for a stamp mill to process ore. A long adit was blasted into the mountain just above the mill level with hopes of reaching deeper veins inside the mountain. Entering the Old Hundred Mine on an electric tram. The boarding house still stands on the side of the mountain. Damaged by deep snows in the winter of 1983-84, the roof has been repaired and the boardinghouse and tram station stabilized by some very brave carpenters and helicopter pilots. Inside the Old Hundred Mine; near Silverton, CO. The bunkhouse was built to house 40 miners and a cook. 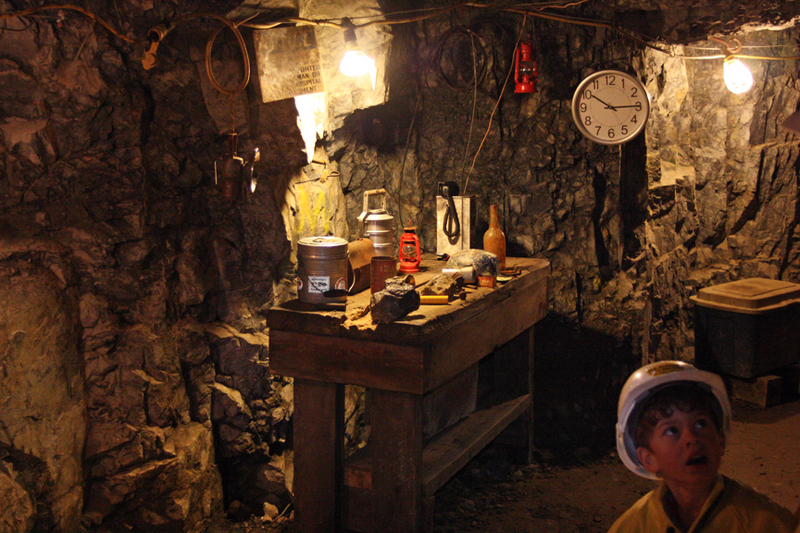 Miners would stay there for two weeks at a time, with two shifts rotating through the bunks. When they got their pay after two weeks, they would either take a slow mule down the steep trail (just wide enough for two mules to pass each other and much narrower than that now) or ride the tram buckets down. 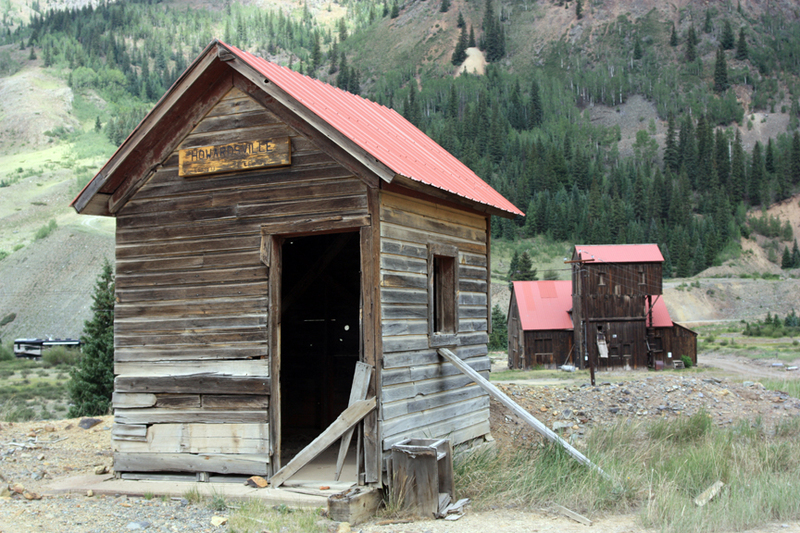 In Silverton, they would spend their money on gambling, whiskey, and women and head back to the mine after the weekend dead broke. Some miners had better sense, saving up money to send for their families in Cornwall or Ireland or elsewhere. Charges set to blast the face at the Old Hundred Mine. With the improvements made, mining continued in earnest. 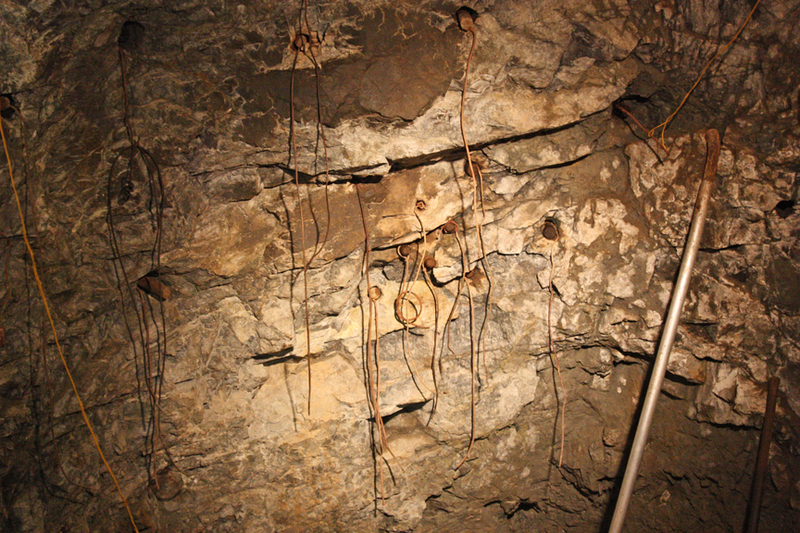 Over 16,000 ounces of gold was removed from the mountain by 1908, but then the veins dried up. The panic of 1907 also dried up the money for further investment, and the property defaulted back to the Neigold brothers. Eventually the mine was lost to back taxes, and the last of the brothers died in 1927. A working mucker inside the Old Hundred Mine. Other owners worked the mine sporadically until 1967, when the Dixilyn Corporation brought new investment. The Mill Level Tunnel was continued over 5000 feet into the mountain and other levels were also extended and connected. A modern mill was built with better techniques for processing the low-grade ore, but the mine remained unprofitable. By 1973 it was finally realized that the deeper veins just weren’t there. The buildings and mill were torn down and sold for scrap. 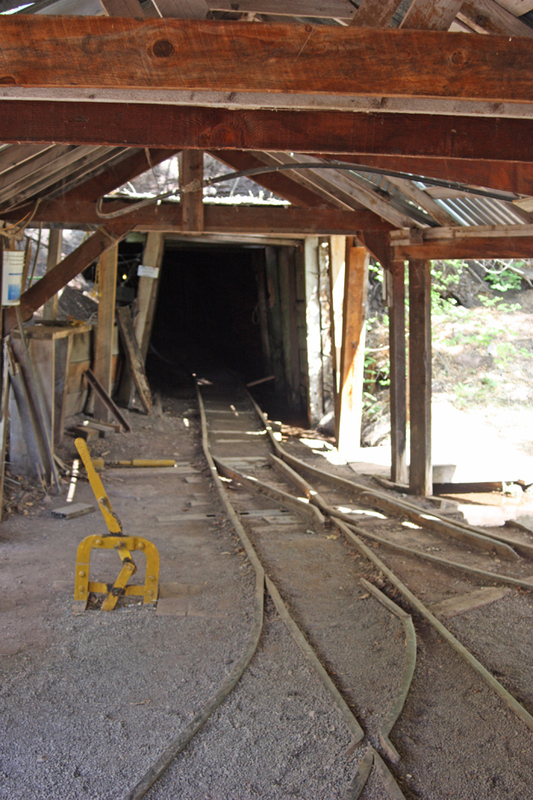 To find out more about the history of the Old Hundred Mine, go to: http://www.minetour.com/history.php. For our tour, we donned hard hats and slickers, then boarded an electric tram and travelled deeply into the Mill Level adit. There is something a bit spooky and exciting about zipping along a railroad line underground in an open car. 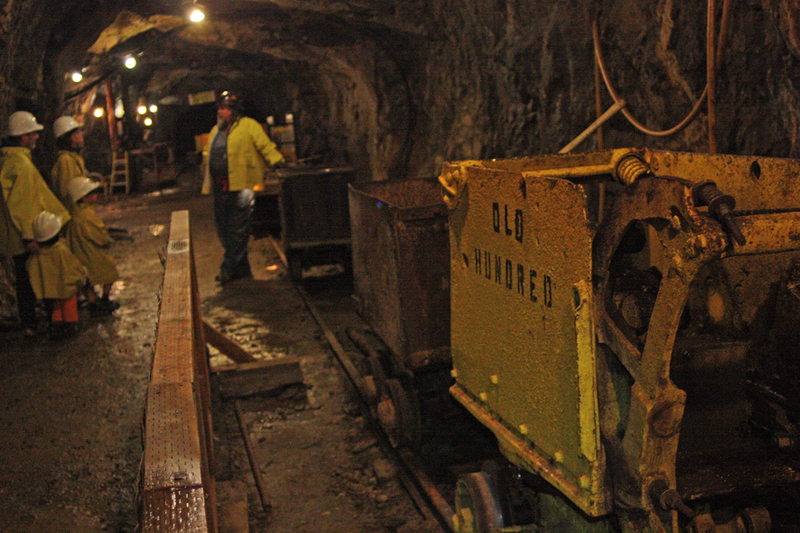 Since this mine only closed in the 1970s, they have kept some equipment inside in working order. Our guide demonstrated a working drill and even a pneumatic mucker, which are not usually available. Lots of old muckers are found with the rust painted over as standing displays outside of the mines (including some at this mine), but this is one of the only times I’ve seen one actually working. Painting of the No. 7 Level at the Old Hundred Mine. Number 7 Level above the Old Hundred Mine. 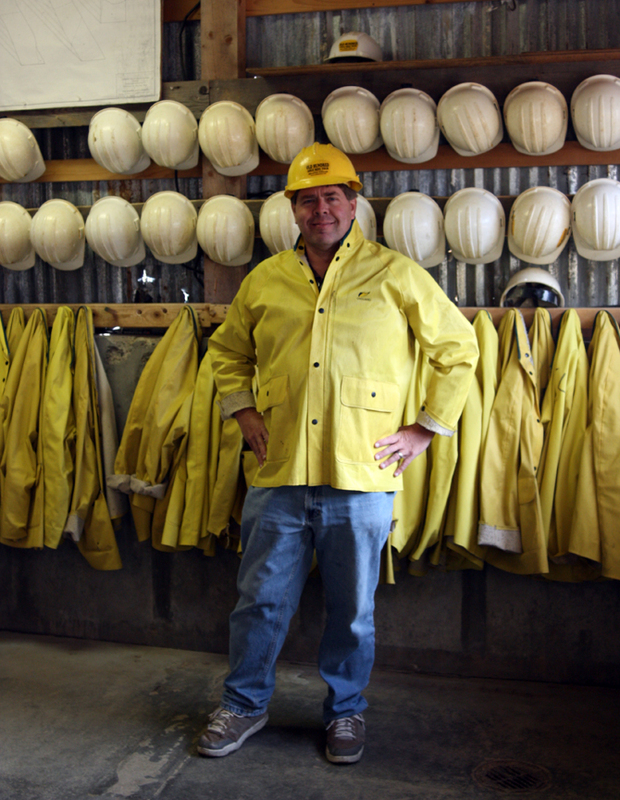 The tour was truly enjoyable, and I would recommend it as one of the best in Colorado, along with the Mollie Kathleen Mine tour in Cripple Creek. 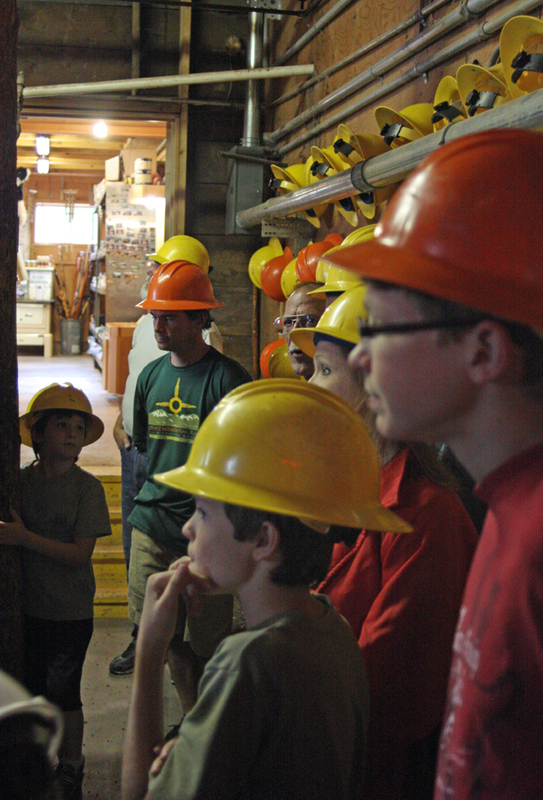 Our guide was knowledgeable and he gave us a good explanation of the technologies and history of the mine. Running my HD camcorder to record all that the tour guide said meant I couldn’t take many photos during the tour itself and some were taken rather hastily and turned out blurry in the darkness. After the tour I took photos around the mine entrance and of the boardinghouse high above us on the cliff. I also bought a used hard hat in the gift shop to add to my collection. 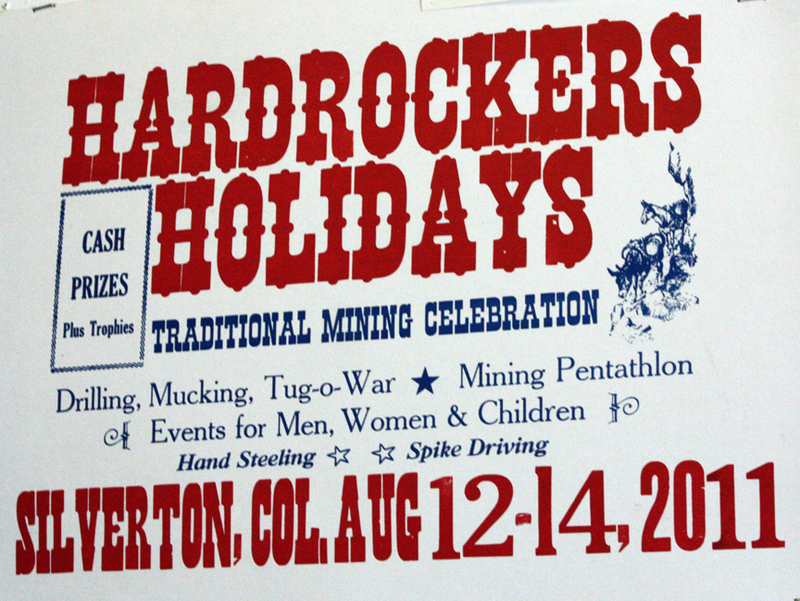 Poster for the annual Hardrock Holidays celebration in Silverton, CO.
Sign for the Bachelor-Syracuse Mine in Ouray, Colorado. Two posts ago I outlined my jeep tour up into the San Juan Mountains of Colorado around Ouray to visit Yankee Boy Basin and the Camp Bird Mine. Now, let’s move on to what I did during the afternoon on Day 4 (Thursday, July 12, 2012) of my journey through Colorado’s mining history. Touring through the Syracuse adit. I returned to my room after the jeep tour to recharge my electronics and to rest my spine. I then found a fun hamburger joint in town on Main Street for lunch, and drove north about a mile to the turnoff to Country Road 14 to Gold Hill and the Bachelor-Syracuse mine. 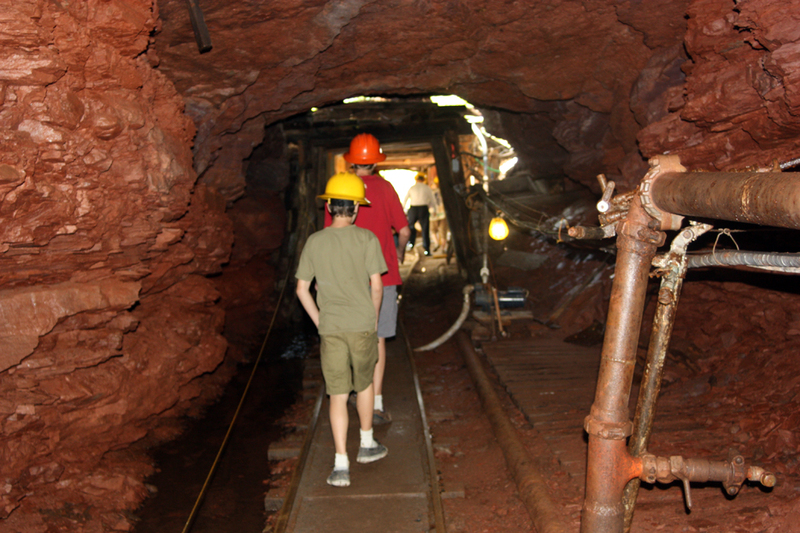 This was the first actual mine tour on my trip. Change room at the Bachelor-Syracuse mine. During the main silver rush in Ouray (1876 to 1893) most of the silver mines were located up Box Canyon, up Canyon Creek in Yankee Boy and Imogene Basins, and around Ironton and Gastun to the north of Ouray. One other area was north of Ouray around what became known as Gold Hill. There was enough gold at the site to survive the Silver Panic of 1893. 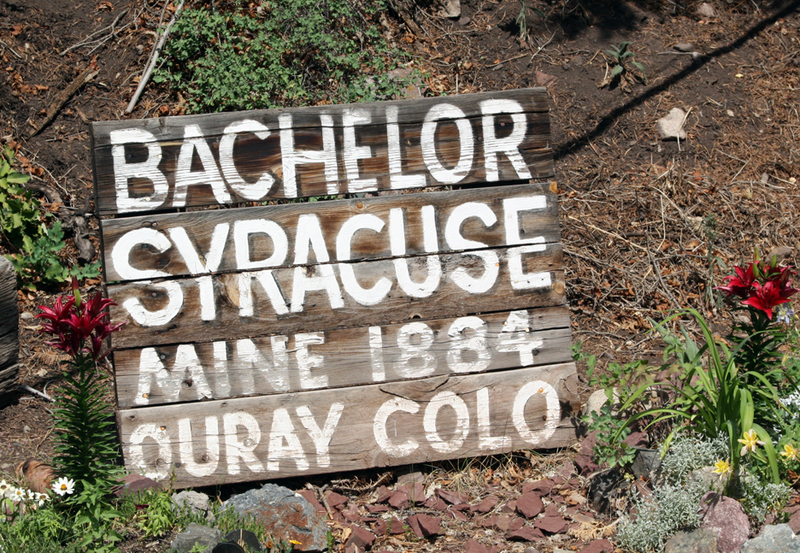 The Bachelor mine was claimed in the early 1890s by three bachelors, C.A. Armstrong, Frank Sanders, and George R. Hurlburt. Seeing as how none of them were attached, they settled on the name Bachelor Mine. It was a high producer and eventually bought out other claims in the area. The main shaft drilled downward from the top of the hill and eventually reached over 2000 feet into the mountain. As the shaft got deeper, ground water began to flood the mine and it became increasingly expensive to haul every ore bucket up out of the mine through the shafts to the top of the hill. A drainage adit was drilled from the east, which allowed the mine to go even deeper. In the 1920s, another adit was needed to come in from the west into the bottom of the mountain to drain deeper water and allow the ore to be removed more easily. It was hoped that the adit would pay for itself by encountering new ore bodies along the way, and it was named the Syracuse Tunnel since the money to build it was raised mostly in Syracuse, New York. Portal of the Syracuse adit and entrance to the Bachelor Mine. Today, the mine tour goes in through that adit. The electric tram that used to carry in miners and then tourists has been shut down, so that we had to walk in about 1500 feet after donning hard hats. When the tram was running, the tour went in 3500 feet, but this deeper tour is no longer allowed for safety reasons. It had been a nice, warm day in Ouray with a few rain sprinkles, but it felt good to walk into the cool mine with temperatures in the 50s. It was fairly damp inside, with water dripping from the ceiling in places. Even now, a steady stream of water drains out of the mine in a ditch to the right of the tracks. They showed us how the pneumatic drills were used to hammer out a series of holes in the face following a pattern of concentric circles. The guide actually turned on the drill for a few seconds, which was very loud in such a confined space. In addition to getting rocked up, old time miners often went deaf as there was no hearing protection used. Since I was recording the tour with my HD videocamera, it was difficult to take still photos at the same time. I will eventually capture still frames from the video and add to this post, but for now you’ll have to make do with photos from the outside. I found that the headlamp I had purchased to provide more light for my camera worked fairly well. Between trying to point my head in the right direction to provide light for my camera and looking through the LCD screen as I was trying to walk made for several bumps of my head on the ceiling (hanging wall), especially in the side drifts. I’m glad we wore hard hats. 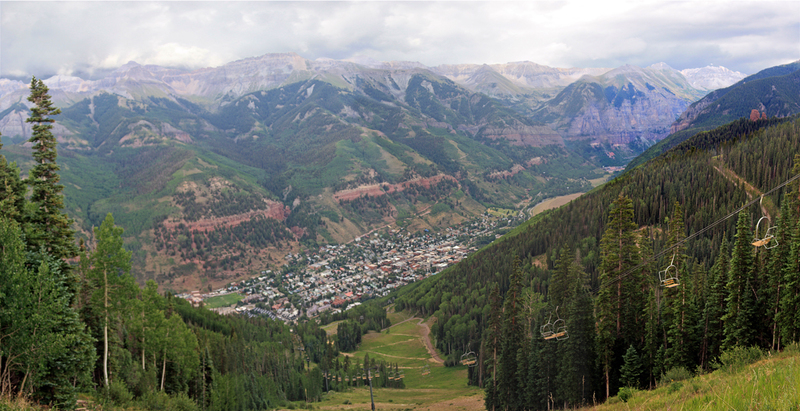 A panorama of Telluride taken from the top of the gondola lift. After the tour, I took a few photos outside, then drove on to the north on Highway 550 to Ridgway, then turned west and eventually south, then back east again on Highway 145 to reach Telluride. Although only about 10 miles from Ouray as the crow flies (right over the route I took this morning on the jeep tour), it takes about 50 miles to go around on passable roads. Imogene Pass can be taken in between, but only in a 4 x 4. Then there’s Black Bear Pass, the most dangerous pass in Colorado. Someday maybe I’ll be back and try it, but absolutely not in a minivan. 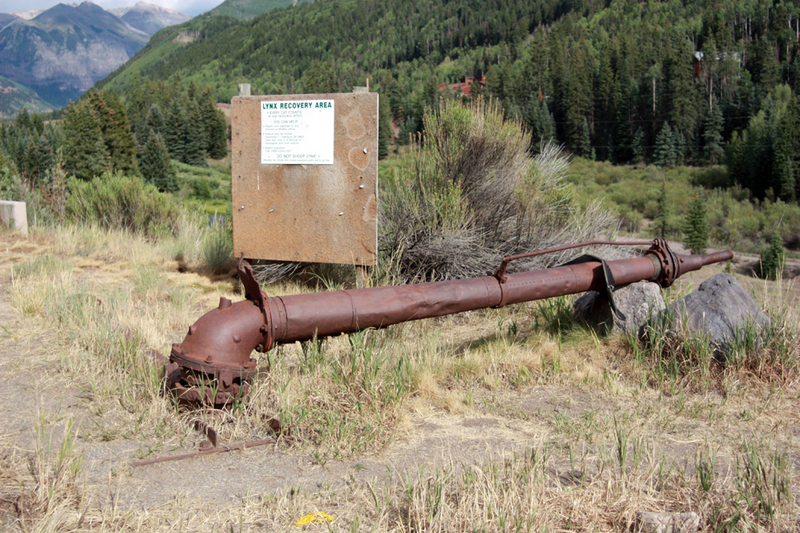 Water cannon nozzle used for hydraulic mining near Telluride, Colorado. On the way into Telluride, I stopped at an overlook that described how mining was done in the lower parts of the San Miguel Valley. Gold was scattered here in the gravel bars along the river, and early panning was unable to reach the deeper grains. Hydraulic cannons were installed to wash the gold out of the gravel. Water from upstream was diverted into ditches that became progressively more narrow and steep, putting a great deal of pressure on the water. Finally, it would be directed through a moveable nozzle at the gravel beds to wash the gravel and gold away. This slurry was collected in sluice boxes and riffle beds where the gold particles would settle out. It was effective and cheap, but it left lasting scars all along the riverbed. Since all the topsoil was also washed away, the scars remain to this day since nothing can yet grow there. Hydraulic mining was also used in the California gold rush; It is especially bad along Highway 149 in Mariposa County. 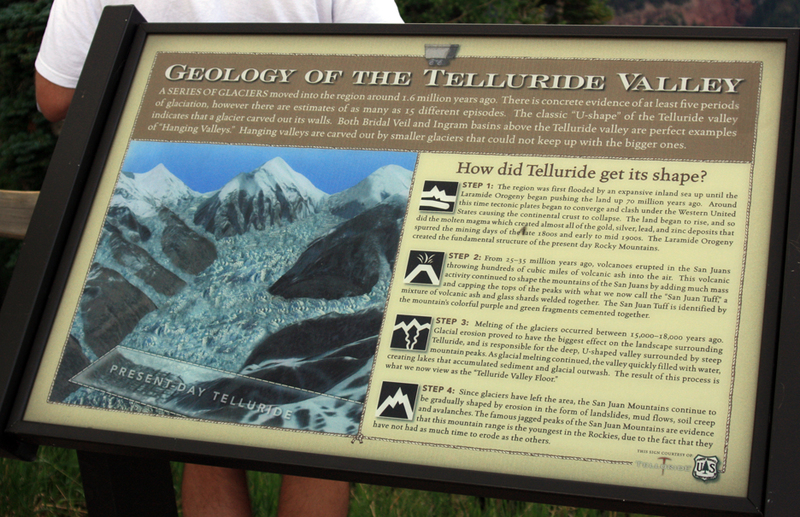 Geology of the Telluride, Colorado area. Telluride is a former mining town that has gotten developed into a ski resort and tourist attraction, which was good for business but not so good for history. Most of the mine dumps and infrastructure have gotten erased to make way for ski slopes. Some of the original buildings remain, but it is hard to tell which are which since modern buildings were designed to match the original 1890s style. Much of the main mines, such as the Pandora, were further up the box canyon from Telluride and the dumps and tailings piles can’t be seen from town. Telluride, Colorado from the gondola. The first gold was discovered in 1858 in the Marshall Basin above Telluride. 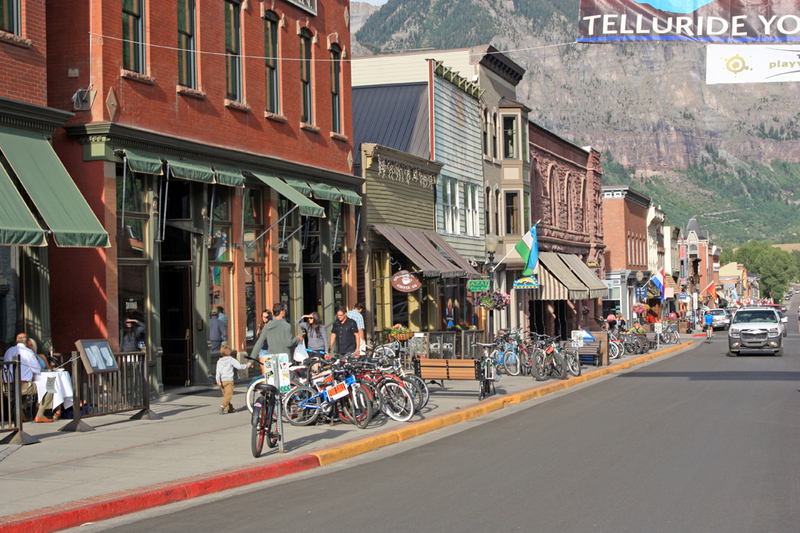 The first successful claim occurred in 1875 and the town of Columbia, later Telluride, was founded in 1878. Interestingly, the type of gold in Telluride was not telluride ore (as is found in Cripple Creek). 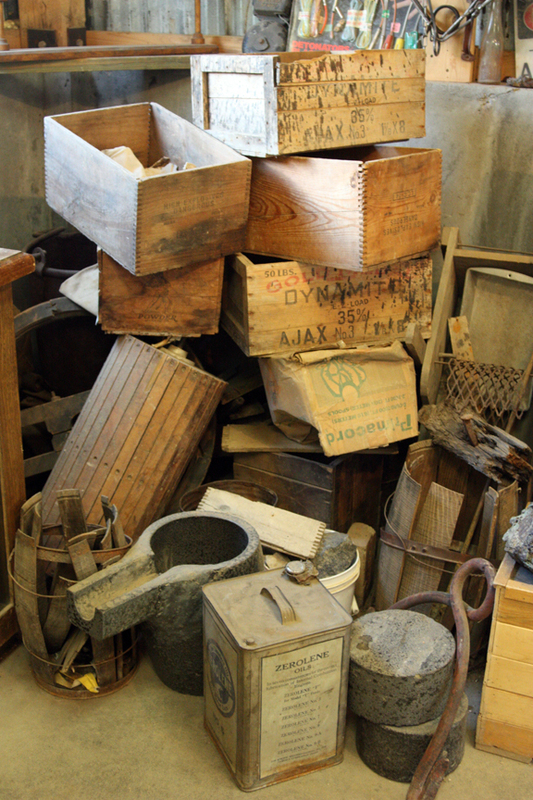 In addition to gold, silver, zinc, lead, and copper were mined. Because of its extreme isolation, Telluride grew slowly until the railroad finally arrived in 1890 built by transportation entrepreneur Otto Mears. At its height in 1900, the population reached about 2500. Telluride, Colorado: July 12, 2012. One of the most historic events in the town was the robbery of the San Miguel Valley Bank in 1889 by none other than Butch Cassidy, his first major heist. He got away with $24,580. In canyons to the south are the ghost towns of Alta and Ophir. Ophir boasts the first alternating current hydroelectric plant in the world, the Ames Hydroelectric Generating Plant. 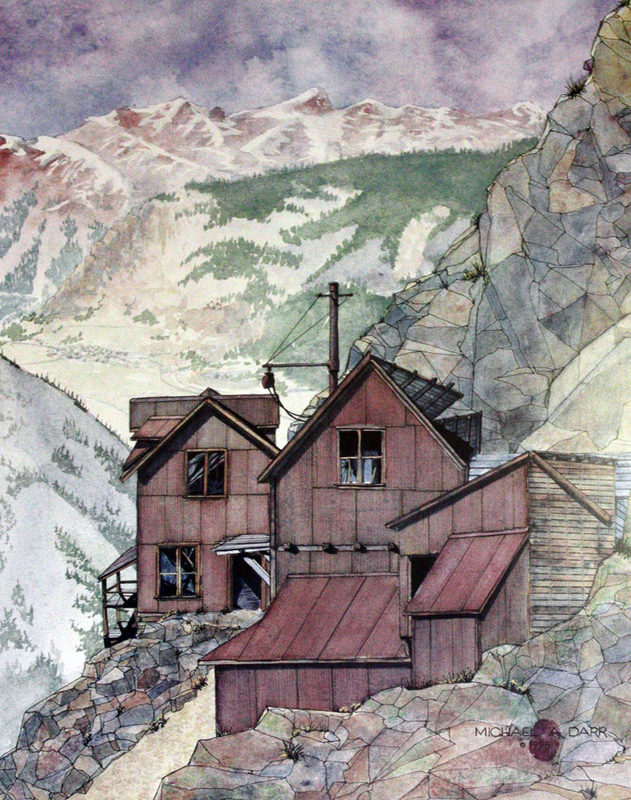 The second plant in the world was in Telluride at Bridal Veil Falls and served the pumps at the Smuggler-Union Mine. The Ames plant was designed by Nicola Tesla and George Westinghouse and financed by Lucien Lucius Nunn, a prominent Telluride banker. Westinghouse was reputedly paid with a pouch containing $50,000 worth of gold. When first activated, the engineers realized they had a problem: they didn’t know how to switch it off safely. It could only be turned off when the power cycle reached zero or the switchman could get electrocuted. Finally, the power failed when a squirrel shorted out a transformer (which was unfortunate for the squirrel). With the power finally off, the Nunn brothers were able to install a safer switch. Eventually these two plants became the Telluride Power Company. The gondola ride continues over the top of the mountain to Mountain Village. Interestingly enough, all this has a tie in to Orem and Provo, Utah, where I live. The mines in the Tintic Mining District around Eureka, Utah, about 40 miles away, were having a similar problem with water flooding the lower levels, and decided to install electric pumps. The closest reliable water supply was the Provo River where it exits the Wasatch Mountains (about a mile from Walden School of Liberal Arts, where I teach). So the mine owners contracted with the Nunn brothers to build a power plant in Provo Canyon, which was called the Olmsted Station. Not only did it provide power for about 3000 homes (and still does), it also housed an electric power education institute for about 40 students. So as a child growing up in southern Utah, the power company was Telluride Power. It eventually merged with Utah Power and Light. Today there is a park in Provo Canyon near Bridal Veil Falls (just like in Telluride) called Nunn Park. By the 1930s the mines at Red Mountain Pass (such as the Idarado) had followed the veins toward Telluride and the Pandora, Tomboy, Smuggler-Union, Nellie, and Sheridan mines near Telluride had followed the veins in the other direction. Eventually they met up, and ore and men could be transported underground all the way from Red Mountain Pass to Telluride. The mines were consolidated by 1953. The mill at the Pandora portal continued to process ore until 1978. Fortunately, after mining closed down another business was available: skiing and tourism. With the addition of ski runs, a free gondola connecting Telluride with Mountain Village, and several music and film festivals during the year, Telluride is now flourishing even though it may not have much left of its historic mining flavor. 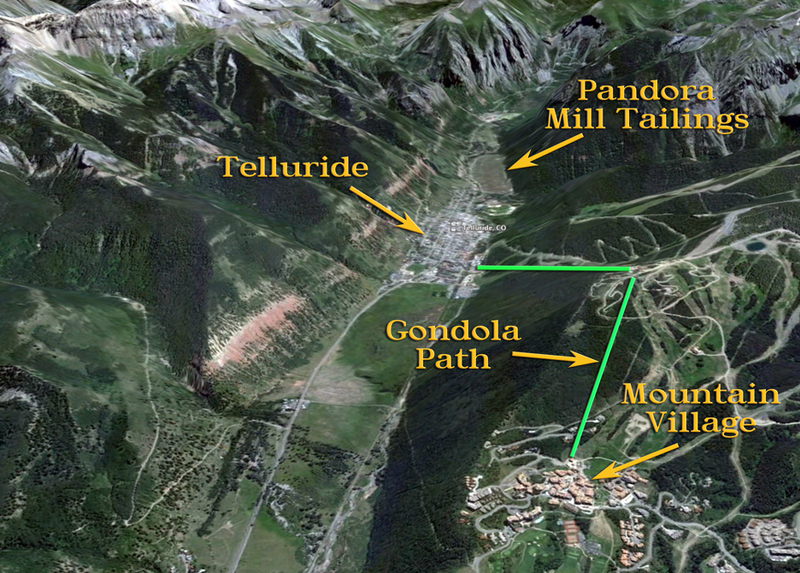 A Google Earth view of Telluride, showing the gondola run and Pandora Mill tailings pile. 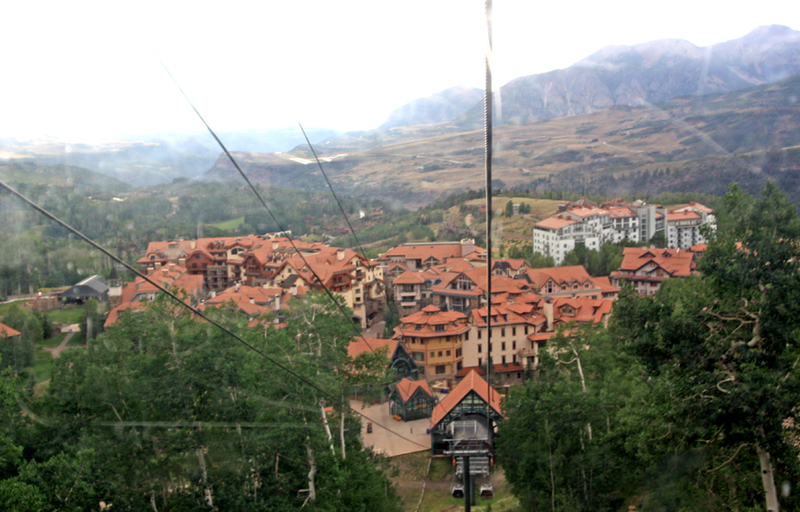 I rode the gondola up the mountain and got some impressive views of the canyon below. I walked the streets for a while, then discovered I was starving and ate some excellent Chinese food at a restaurant in town. I tried to talk Chinese to the owners, but no one could understand me except their young daughter. I guess my Chinese is pretty rusty; thirty years ago I was fluent, but not anymore. I drove back to Ouray and fell into bed after plugging in all my cameras to recharge. I had wanted to go swimming at the hot springs/pool complex north of town but was too tired to attempt it.